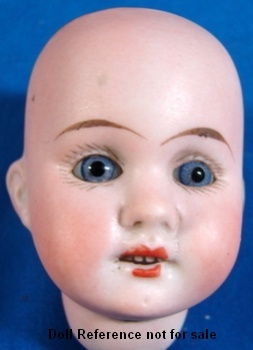 Gebrüder Knoch bisque socket head doll, doll mold 193, glass eyes, single stroke eyebrows, upper and lower painted eye lashes, open mouth with teeth, jointed composition and wood body. Founded by the brothers (Gebrüder) Ernst and Christian Knoch in 1877, their porcelain factory was located at Neustadt near Coburg, Germany. Many early Knoch doll heads are unmarked. 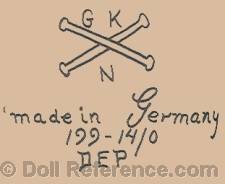 Some Gebrüder Knoch doll markings are; GKN (Gebr. 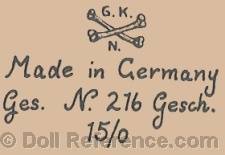 Knoch Neustadt), a symbol of two crossed bones, made in Germany, a mold number, DEP. Some heads are marked Ges. Nr. Gesch. with a mold number, but no trademark symbol. 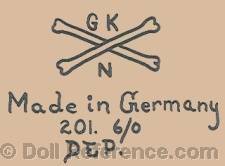 Note the German words; gekreuzte knochen, translates in English to crossed bones, which gives you a clue as to why Knoch might choose this symbol for their doll mark. In 1919 the Knoch company was acquired by Max Oscar Arnold, at which time bisque doll head production ceased.